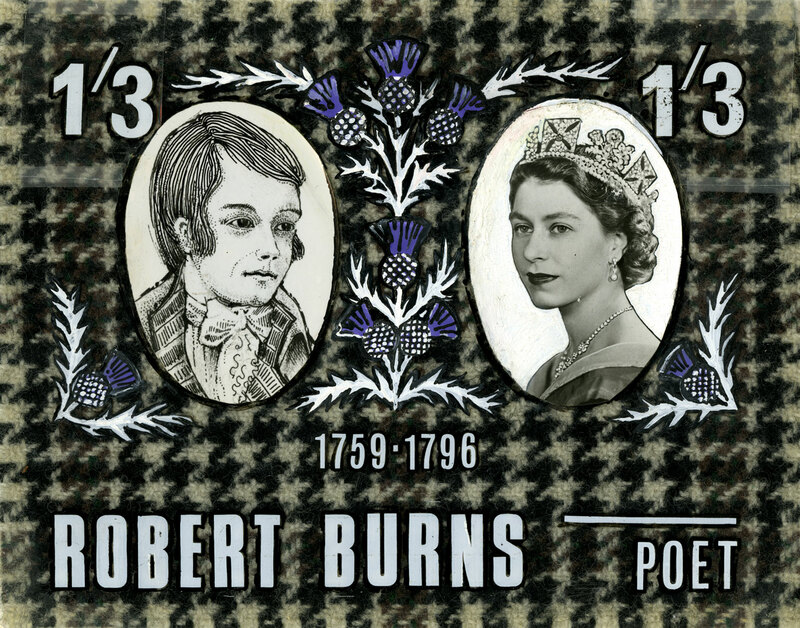 Should auld acquaintance be forgot...Assistant Curator Georgina remembers a Scottish poet Robert Burns through stamps. 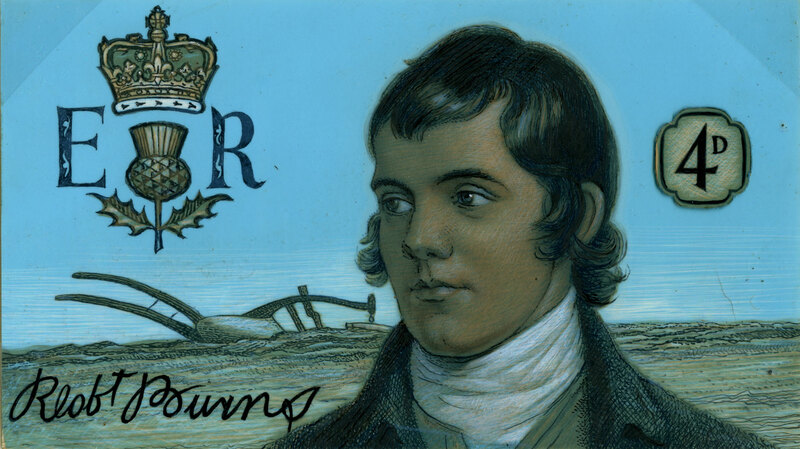 Robert Burns was the eldest son of a farmer, who from an early age had a talent for writing. However, it wasn’t until the age of 27 that he shot to fame with his first published collection of poetry. 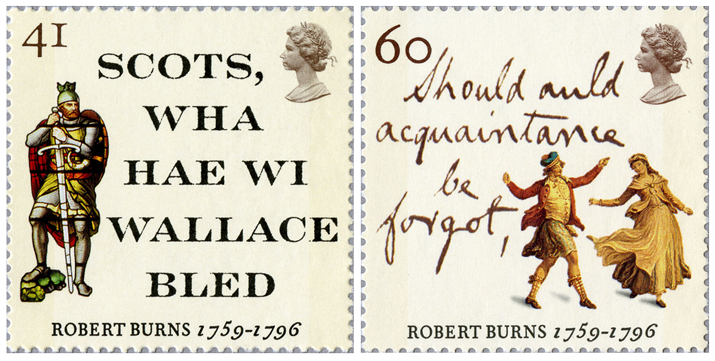 Burns sadly died at 37 but his words have lived on and are recited by many around the world. Burns night is celebrated on the 25 January, the day of his birth. It’s an evening to enjoy supper with friends and recite his work. A haggis is normally served and toasted by the respective guests. At the end of the meal, a tribute to Burns is made called ‘The Immortal Memory’ and the evening is concluded by signing Auld Lang Syne. 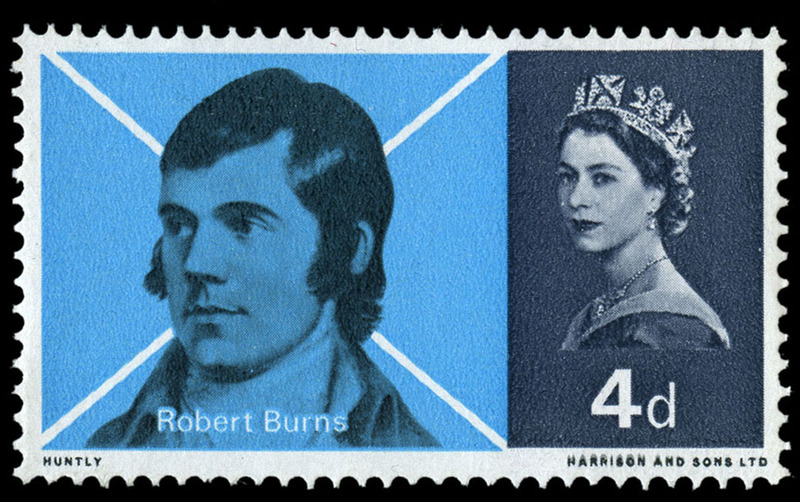 The first request for a stamp issue to commemorate Robert Burns was seen in Parliament in 1955 but it wasn’t until 1966 that a stamp was issued. It was not initially the GPO’s policy to issue stamps commemorating individuals but in 1965 this changed, and the Post Master General announced the upcoming Burns issue. The Stamp Advisory Committee (SAC) decided that Scottish artists should be asked to submit designs for the stamp. Eight artists along with the printers Harrison & Sons and Bradbury Wilkinson were invited. The printers declined as neither had a Scottish artist working for them at the time. Stewart Black submitted designs featured the Burns family tartan as the background. Along with the portraits of Burns and Queen Elizabeth II he also surrounded the portraits with the Scottish thistle. For this stamp issue it had been agreed that non-traditional design could be submitted which included withholding the Queen’s head. 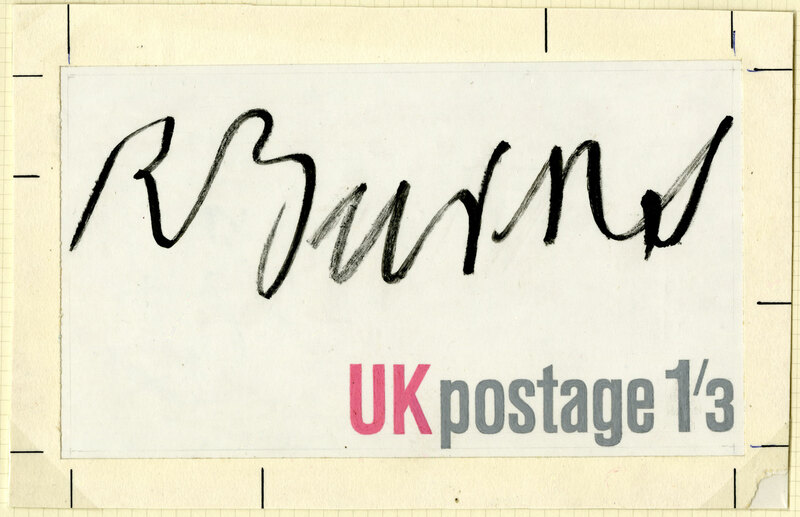 Jock Kennier’s design focused on the signature of Robert Burns and instead of the Queen’s head used the words ‘UK postage’. This design was the SAC’s first choice on the 22nd of September but they asked to see it again; this time with the Queen’s head. Neither of these designs were finally chosen and instead Gordon F. Huntly won the commission focusing on his two portraits of Burns. His 1/3 stamp featured a portrait by Alexander Nasmyth from 1787, this image also influenced the portrait on the 4d stamp by Archibald Skirving who never met Burns but produced his likeness from Nasmyth’s picture. As you can see the Queen’s head is present as the SAC were informed that designs with the effigy would be preferred. 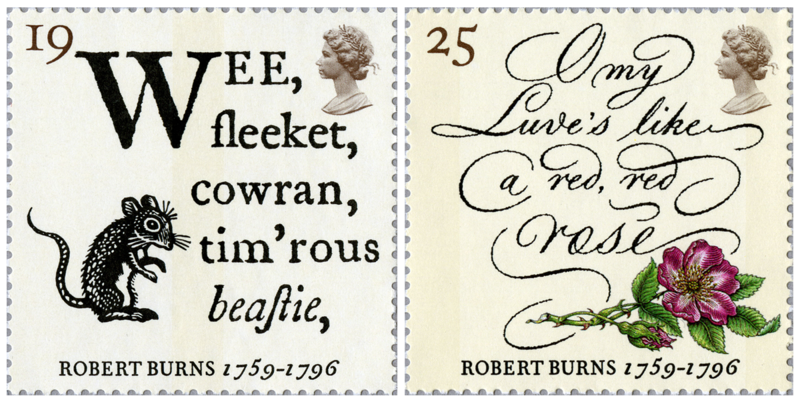 In 1996 Royal Mail decided to pay tribute to Robert Burns by using his words as the focal point of the stamp set. His piece ‘O my luve’s like a red red rose’ was written in 1793 and talks of the struggles of separation from the one you love. They also featured ‘should auld acquaintance be forgot’ from Auld Lang Syne which many of us sing with loved ones to see in the New Year (Hogmanay). 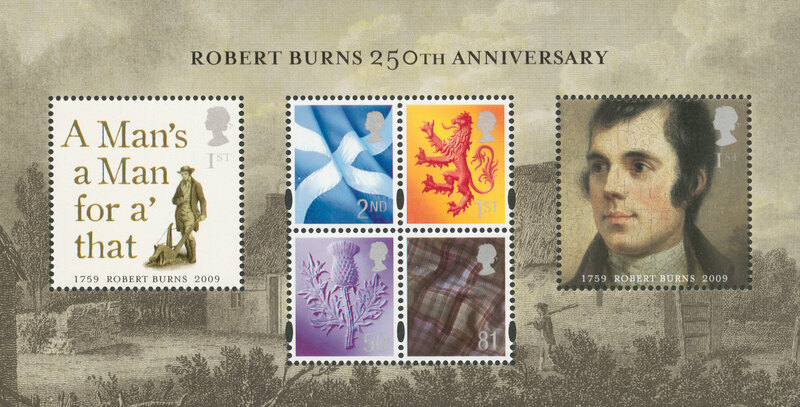 2009 marked 250 years since the birth of Robert Burns and to commemorate this a miniature sheet was produced. This featured four country definitives from Scotland and two commemorative stamps. 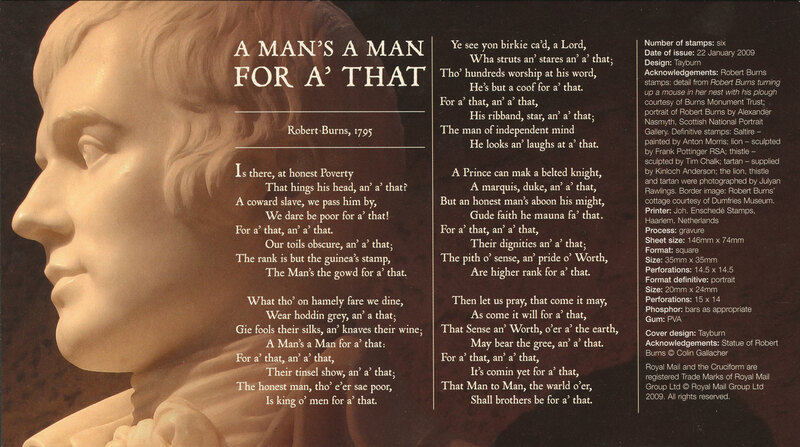 Again the Nasmyth portrait of Burns is used and the title of one of his songs ‘A Man’s a Man for a’ that’ which expresses his egalitarian values of equality. 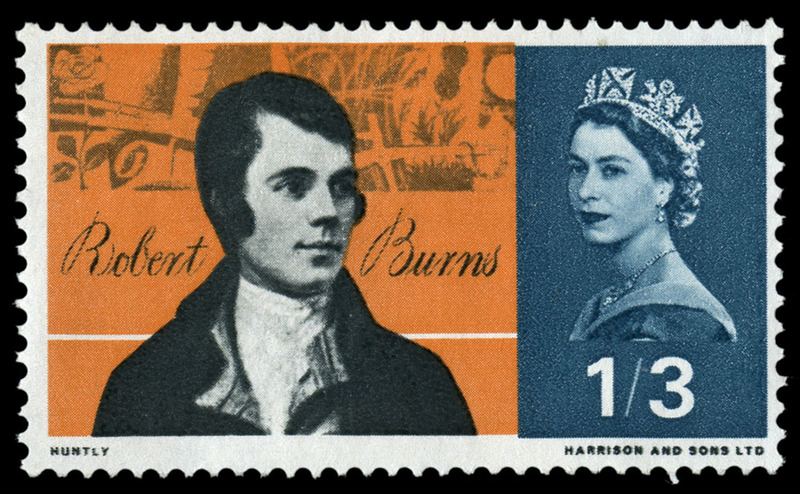 Burns is unique in that he has appeared so many times on stamps and is not a member of the Royal Family. Will he appear again? We’ll have to watch this space. I hope those of you who are celebrating Burns night enjoy the festivities and pay tribute to the man…and the Haggis!